Nikon binoculars come in over 20 series. 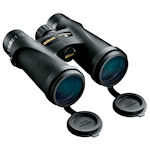 Top choices from Nikon birding binoculars, to astronomy binoculars to zoom binoculars to compact binoculars. You can never go wrong when choosing from Nikon binoculars gallery of optics. Nikon Monarch HG binoculars are designed to meld high grade ED glass and multi-layer coatings with a rugged magnesium chassis for an outstanding outdoor experience. The HG is available in 8x42 and 10x42 configurations. 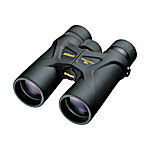 EDG II binoculars are made with Nikon's ED glass and the finest coatings available for superb brightness and clarity. EDG II binoculars come in 32-mm mid-size and 42-mm full-size versions. With large fields of view and excellent depth of field, EDG II binoculars are intended for the serious nature enthusiast. 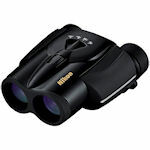 Nikon Monarch 5 ATB binoculars feature ED glass, dielectric prism coatings, lower weight, and a short minimum close focus. Monarch 5 binoculars are a diverse line with 42- and 56-mm objective sizes in a variety of magnifications. There's a Monarch 5 to fit anyone's needs. Nikon Action Extreme ATB binoculars are rugged porro prism designs for the active sportsman. 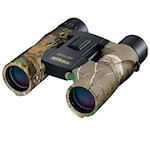 Action Extreme binoculars feature durable all-metal chassis with black or Realtree APG armoring. BaK-4 glass prisms and multi-coated, aspherical eyepiece elements offer the brightest, tack-sharp images. Nikon Aculon A211 binoculars are porro prism designs with 35mm, 42mm and 50mm objective lenses, and include 8-18x42 and 10-22x50 zoom models. All feature rugged, durable construction, high-tech coatings and legendary Nikon quality. All are made with Nikon's lead- and arsenic-free Eco glass. Nikon Aculon A30 Binoculars are dual hinge compact roof prism binoculars, weighing less than 10 ounces. They will fit comfortably in a shirt pocket, convenient to carry anywhere. The Aculon A30s feature multi-coated ECO-Glass. 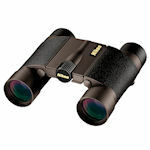 Nikon Aculon T01 Binoculars are stylish, lightweight roof prism compact binoculars. The 8x21 and 10x21 models are available in a variety of colors to fit your style. Made with multi-coated lenses and turn-and-slide eyecups, Aculon T01 binoculars are both bright and comfortable to use. 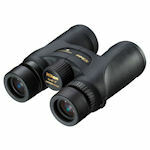 Nikon Aculon T11 zoom binoculars are a super-compact reverse porro prism design with zoom magnification. The Aculon T11 binoculars offer an adjustable zoom range of 8-24x. Featuring multi-stop twist-up adjustable eyecups and made with BaK-4 glass, the Nikon Aculon 8-24x25 T11 binoculars are available in either black, blue, white or red. Aculon W10 binoculars are waterproof compacts available in 8x21 or 10x21 and a variety of colors. They feature twist-up eyecups, multi-coated lenses, and a smooth center focus knob. 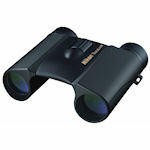 Nikon Astroluxe 10x70 binoculars are large porro prism binoculars designed for astronomical use. 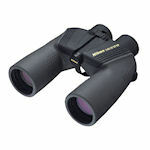 Astroluxe binoculars have a tripod mount for steady viewing, but can be removed from the tripod for terrestrial viewing. Nikon OceanPro binoculars are 7x50 porro prisms designed for the harsh marine environment. Available with an intrinsic compass, OceanPro binoculars feature durable frames and heavy rubber armoring. Fully-coated optics and BaK-4 prism glass ensure the brightest, high-resolution image quality. 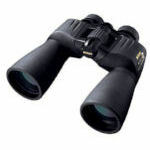 Nikon Monarch 3 binoculars are the basic version of Nikon's popular binocular series. They have a 9.8-ft. close focus and metallic silver prism coatings. Monarch 3 binoculars are light at just 25 oz. They are available in 8x42 and 10x42 versions in black or Realtree camo armoring. 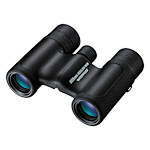 Nikon Monarch 7 ATB binoculars are the top of this popular line. Compact for a full-sized binocular, Monarch 7s feature Nikon's ED glass, an 8.1-foot close focus and very wide field of view. 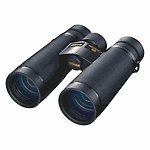 Available in 8x30, 10x30, 8x42 and 10x42 models, Monarch 730mm binoculars weigh just 15.3 oz. and the 42mm models weigh 23 oz. Nikon Premier binoculars are built to meet the standard of discriminating birders. These full-sized, mid-sized or compact binoculars feature Nikon's Eco glass, modern coatings and a lightweight frame housed in ergonomic rubber armor. Nikon ProStaff 3S binoculars are known for their wide field of view and high light transmission at this entry point price level. Available in 8x42 and 10x42, they are waterproof and fogproof, and rubber armored. 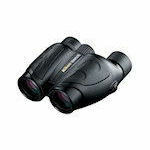 Nikon ProStaff 5 binoculars are roof prism designs in 8x42, 10x42, 10x50 and 12x50 models. 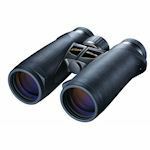 ProStaff 7 binoculars are lightweight, nitrogen-purged to be waterproof, and have fully multi-coated lenses and BaK-4 prisms for the brightest, distortion-free view. 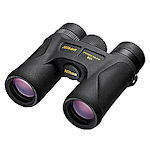 Nikon Prostaff 7S binoculars are a favorite economical series for hunters. Their lenses are fully multi-coated Ec0-Glass, and have phase-corrected BaK-4 prisms. Prostaff 7S binoculars are waterproof and nitrogen purged. The body is rubber armored and the eyecups are twist-up with detents. 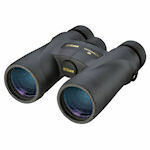 Nikon ProStaff ATB binoculars are reverse porro prism designs available in 8x25, 10x25 and 12x25 models. ProStaff ATB compact binoculars are waterproof, rubber-armored, and feature Nikon's Eco glass - legendary Nikon optical quality in a tiny package. 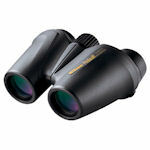 Nikon's Trailblazer ATB binoculars are compact roof-prism models available in 8x25 and 10x25 versions. Fully waterproof and with fully multi-coated lenses, the Trailblazer ATB binoculars won't disappoint optically. 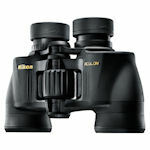 Trailblazer ATB binoculars are made with Nikon's Eco glass. Nikon Travelite binoculars are compact reverse porro prism designs. 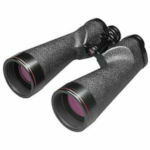 Travelite binoculars are made with BaK-4 glass prisms and multi-coated optics to deliver bright, distortion-free images. 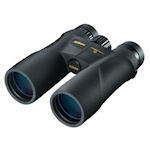 Nikon Travelite binoculars come in 8x25, 10x25 and 12x25 models.